The Sarah Moody Gallery of Art presents Pinkney Herbert: Distilled – The Narrative Transformed, September 29 – November 4, 2016. The public is invited to hear the artist talk about his work on Wednesday, October 5, at 7:00 p.m. in 205 Gorgas Library on UA campus. On Thursday, October 6, everyone is invited to an Art Night reception for the opening of the exhibit from 5:00-7:00 p.m. in Garland Hall. Come early at 4:00 p.m. for a reception just across Woods Quad for the Matt Ziemke and Melissa Stern exhibition in the Sella-Granata Art Gallery. Distilled—The Narrative Transformed is a look at paintings and drawings by Pinkney Herbert from the last 30 years. 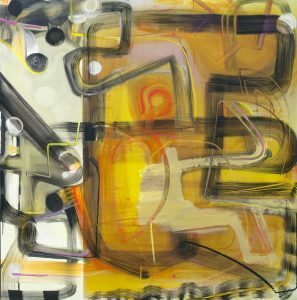 Inspired by place and process, Herbert’s work is a spirited exploration in a language of color and line derived from the sights, sounds and energies of Memphis and New York, cities he divides his time between as producing artist. Herbert refers to painting as a physical act and it is very apparent in the exhibited works, rife with movement and discord. Drawing inspiration from art historical and vernacular sources—including patterns, street signs, advertisements, and architecture, Herbert responds and layers imagery until he has created a sense of living places around him. Digital imagery is Herbert’s latest addition to his paintings. His visual vocabulary of shapes and patterns expands as printed images are affixed to the painting ground, much like the neon lights of Times Square. oil, digital print on wood, 60 x 60 inches. 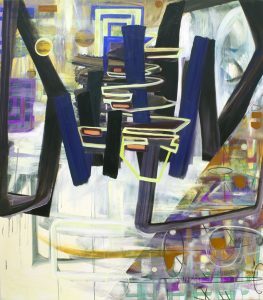 (bottom left): Pinkney Herbert, “bridge 1,” 2013, oil, digital print on canvas, 78 x 68 inches. Contact: Vicki Rial, SMGA exhibitions coordinator: vicki@ua.edu or (205) 348-1891.